The exact origins of Gnocchi are not known, but we do have Spanish to thank for bringing the humble potato to the homes of all Italians. Classed as pasta this classic is a dumpling using potato as the main ingredient which is a perfect vessel to carry the flavor of this rich tomato sauce. Add the flour, cheese and choux pastry to the mash and knead to make a soft dough, be careful not over work, we need it to be light and fluffy. Dust a work surface with flour and using small batches roll out the dough in thin logs. Dust a knife with flour and cut the dough into small pillow shapes. Place the Gnocchi into a large pot of simmering water, once they float they are ready to add to the sauce. Add the oil to a sauce pan and sauté the onion, garlic, chilli, bay leaf and rosemary till fragrant and soft. Add the Knorr Tomato Pronto, cheese,Astra Fat Spread and cook for 5 minutes to heat through and slightly reduce. 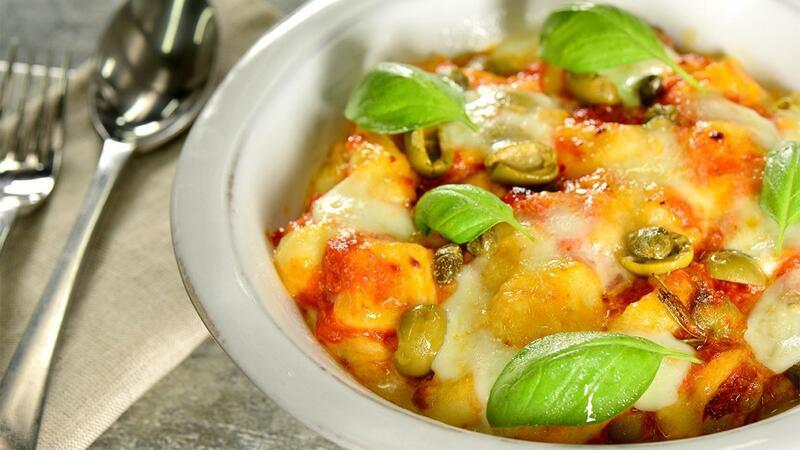 Add the oregano, olives and capers and stir through, add the Gnocchi to the sauce to coat. Transfer the Gnocchi to a bowl and top with sliced buffalo mozzarella, gratinate under the salamander the garnish with fresh basil leaves. Use Choux pastry to keep the Gnocchi very light almost melt in the mouth here is the recipe. Bring the water andAstra Fat Spread to a boil in a pot. Whisk in the flour to make a dough, whisk in the eggs 1 at a time to make a soft paste like dough that just holds it shape.